Vero Beach Homes For Sale! Welcome to Vero Beach Florida Homes.com. The information on this site is dedicated to be the all in one source for your Vero Beach Real Estate needs. My mission is to give you valuable information that will help you decide the type of lifestyle you want to live in Vero Beach Florida. Once you visit Vero Beach Florida, this will no doubt be your destination. My website will lead you to all of the available properties based on your particular lifestyle. Vero Beach is a lovely seaside community with a population similar in numbers to that of Palm Beach Florida in the 1950 ’s. Vero Beach is known as the Gateway to the Tropics, the Crown Jewel of the Treasure Coast and Miami ’s version of the Hamptons. Vero Beach’s international reputation among vacationers and business executives alike make this undiscovered paradise a place that will continue to be written about in the Wall Street Journal and on national news like CNBC as well as in many lifestyle magazines. Many celebrities have discovered that Vero Beach offers them a private beautiful oasis not found in most other parts of Florida. However, you don’t have to be a celebrity to live here but if you are lucky enough to live here you will surely feel like one. Vero Beach was rated Best Small Town in Florida and 12th in the Nation. Cultured and sophisticated Vero Beach is named one of the 100 Best Art Towns in America. Vero Beach was home to the Dodgers from 1948 until 2008. Piper Aircraft and Famous Indian River Citrus are the major industries along side tourism. Vero Beach with its 26 miles of pristine beaches, lush tropical estate size properties, ancient oak lined streets, quaint shopping boutiques, unsurpassed restaurants, and pleasant climate, is a destination for people who want to live the good life. If your lifestyle is tennis, golf, boating (ocean to river), equestrian, retirement living, young adult living, there is an address with your name on in Vero Beach, Florida. VERO BEACH, FL -- October 8, 2014 -- Vero Beach Real Estate Agent Karen Gaskill specializes in helping families buy or sell beach property and residential homes. 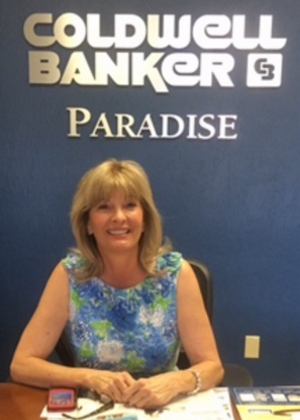 Karen Gaskill has been a licensed real estate broker since 1979.